The Citadel is following the work of NASA astronaut Col. Randy Bresnik (Citadel Class of 1989) from training, to the launch from Russia, and from his time commanding the International Space Station, to when he is back on Earth which is expected to be in December 2017. Cadet Angelica McNerny, began this blog while she was a senior in the South Carolina Corps of Cadets, reporting on Bresnik's training for Expedition 52/53 to the Internaltional Space Station. McNerny is now serving with the U.S. Airforce as an officer in Space Systems Operations training after graduating from The Citadel in May 2017 with a degree in physics. Cadet Rafael "Ralf" Gonzalez, took over the blog in the fall of 2017. He is a mechanical engineering major with a minor in aeropsace studies. He is from Miami. "I have a vested interest in what lies beyond our atmosphere," says Gonzalez. "After graduating from The Citadel, I plan to attend graduate school for aerospace engineering with a focus on astrodynamics and then work for either NASA or a private aerospace company." Gonzalez conducts research with Patrick Bass, Ph.D., a member of college's Mechanical Engineering Department faculty. They are researching orbital mechanics, which involves the design and optimization of spacecraft trajectories. "We have participated in the Global Trajectory Optimization Competition and the Chinese Trajectory Optimization Competition, and we will continue to partake in these and other annual events," says Gonzalez. "Through this blog, I hope to share my love for this complex and lively realm and promote an increased understanding and appreciation of space exploration." We arrived in Houston, Texas in the evening on Wednesday, Dec. 7, excited to meet with Col. Randy Bresnik and to be in Lone Star State. As I settled into my hotel room, I got a surprising phone call from none other than The Citadel Space Star himself, Col. Bresnik. After giving me a warm welcome to Houston, we went over the next day’s itinerary and it began to dawn on me that I was on the phone with one of the handful of men and women who’ve travelled beyond the sky. I went to sleep that night eagerly anticipating the following day. Early Thursday morning, after Citadel videographer Sam McAdams and I checked in and got our security badges, we were lead to Johnson Space Center’s Building 9. It houses the Space Vehicle Mockup Facility, a full-scale replica of the International Space Station, which I’ll refer to as the ISS for the sake of brevity. We briefly met with Col. Bresnik and then he returned to his training on the mockup. The astronauts practiced various emergency scenarios including quarantining atmospheric and ammonia leaks and detecting/extinguishing fires onboard the ISS. Col. Bresnik and his colleagues were equipped with manuals and a training staff of more than fifteen individuals. I was astounded to see the amount of detail that not only comprises the physical mockup itself, but the training as well. I will be sharing more of those details in future blog posts and videos. As I observed the emergency training, I was particularly impressed by the cooperation and teamwork of the astronauts. The American and Russians went back and forth between languages to solve the problem at hand quickly and efficiently. The execution of their duties appeared seamless as they ticked off a very long list of complex objectives— almost second nature due to their attention to detail and copious amounts of practice. Watching the scenarios served as a reminder of just how volatile the interplanetary environment can be. There is no “astro-carpenter” that comes up to fix the ISS when something breaks, or “astro-firefighter” that flies up when something starts burning. The astronauts must be self-reliant and industrious, and above all confident. Not many people can say they’ve met a real live astronaut. I’m thankful every day for the opportunity afforded to me by Col. Bresnik, the Johnson Space Center, Space Center Houston, and The Citadel. Thanks for checking out our blog and stop by soon for more on our #CitadelSpaceStar! "John always had the right stuff, inspiring generations of scientists, engineers and astronauts who will take us to Mars and beyond--not just to visit, but to stay. Today, the people of Ohio remember a devoted public servant who represented his fellow Buckeyes in the U.S. Senate for a quarter century and who fought to keep America a leader in science and technology. Our thoughts are with his beloved wife Annie, their children John and Carolyn and the entire Glenn family. The last of America's first astronauts has left us, but propelled by their example we know that our future here on Earth compels us to keep reaching for the heavens. On behalf of a grateful nation, Godspeed, John Glenn." Col. Bresnik was kind enough to share his thoughts about one of the world's first astronauts. Just click the video below to watch. While visiting Johnson Space Center in Houston recently, I learned a lot about Col. Randy Bresnik’s upcoming space mission. Mission 53 will launch from the Baikonur Cosmodrome, which is located in Kazakhstan and has been the launch site for Soviet and Russian space missions since 1957. The launch is set for late May, with a possible delay of two months. Col. Bresnik, who is commanding the expedition, will be traveling aboard the Soyuz MS-05 spacecraft with two additional crew members, Sergey Ryazanskiy who is Russian and Paolo Nespoli who is Italian. Once docked with the International Space Station (ISS), the crew will participate with Mission 52 until Col. Bresnik assumes command of Mission 53 in September. He will be the first Marine Corps. Officer to command a mission on board the station and the second astronaut to celebrate his 50th birthday in space! Col. Bresnik will be incredibly busy while orbiting above us. Much like cadets at The Citadel, astronauts have their daily schedules planned down to the minute — including their free time. His previous mission, STS-129, in November 2009 lasted only 11 days and included two extravehicular activities, better known as space walks. Due to its longer duration, the Expedition 52/53 astronauts will have significantly more time for a variety of duties and activities. That includes observing the Earth from the ISS’s windowed cupola, something Col. Bresnik mentioned that he is especially looking forward to when I spent the day with him to observe training at the Johnson Space Center. During this time, he and his fellow crew members will be using photography and social media to give us a glimpse into their experiences in space and show us their unique view of the Earth below. Keep checking back for more information and updates as our Citadel Space Star’s launch creeps closer. Col. Bresnik shows me the equipment he uses to train for life is space. The astronauts use the same equipment on the ground that they will use on the space station. I got to try the equipment too! What a day we had! One of the few humans who has walked on the moon, Brig. Gen. Charlie Duke, Col. Bresnik, NASA mission director and Citadel alumnus ('85) Steve Odendahl, NASA planetary geologist, Noah Petro, and ...well...me...joined for a panel at The Citadel in March to discuss resilience in space exploration. It was amazing to be a part of the compelling discussion, led by Dean John Weinstein who heads The Citadel School of Science and Mathematics. Angelica McNerny here with an update about Col. Randy Bresnik (@AstroKomrade) and his training and launch dates with NASA. We heard from him this week. “New experience for me. We are headed head down to Baikonur Cosmodrome as the backup crew to the two gents that will be launching 20th of April, Expedition 51," reported Col. Bresnik in a recent email. We will be watching to see if he takes part in Expedition 51. The launches are amazing to watch livestreamed on NASA TV. You can see them at this link. If Col. Bresnik is not needed for Expedition 51, he will return to his training to take over command of the International Space Station on Expedition 53, which no take place on July 28, 2017, after being pushed back from the original date in May. Much more to come on our Citadel Space Star blog, including a look at how anyone can “play” astronaut at Space Center Houston ─ which would make a great summer trip. And, don’t forget to follow Col. Bresnik’s work on The Citadel’s Instagram and Twitter using #CitadelSpaceStar as well as with his handle @AstroKomrade . MESSAGE 10: LEARNING THE HISTORY OF AMERICA'S SPACE EXPLORATION WHILE PREPARING FOR COL. BRESNIK'S JULY EXPEDITION. Independence Plaza houses the world's only shuttle carrying aircraft display with a mock shuttle attached. Visitors are allowed inside the craft and the mock shuttle to get a glimpse of the extraordinary feat of modern engineering. As a physics major, I enjoyed the educational displays housed within the craft. They demonstrated some of the scientific principles I've learned through my education right here at the Citadel. I'll show you more of the center later. As our space program moves forward, places like Space Center Houston help us remember the milestones we've conquered through the shuttle program and how far we've come. For more on this, check us out on Facebook or follow us on Twitter or Instagram using #CitadelSpaceStar! We are about two months away from the projected July 28th launch of Expedition 53 which will be commanded by Citadel alumnus, Col. Randy Bresnik. When I went to Houston to observe a portion of his training for the mission, he showed us the two NASA Mission Controls at Johnson Space Center - the old, and the new. One is bustling with activity and every type of techonology imaginable that could be needed by the mission control team. The other one is quiet, but full of memories about the earliest achievements and challenges of our country's space exploration. Take a look at both mission controls and don't forget to start planning your launch watch party! The official NASA poster for Expedition 52 is out which means Col. Bresnik's launch date is rapidly approaching. Remember, he is a part of two expeditions, 52 and 53. While he is aboard the International Space Station the station command will be turned over to him, which is when it becomes Expedition 53. We thought you'd enjoying seeing the poster. PS - my last blog post is coming soon. At that time I'll introduce you to our new Citadel Space Star blogger, Cadet Chris Keane. With all eyes on outer space because of the eclipse and Expedition 42/53 to the International Space Station with Astronaut Randy Bresnik, a graduate of The Citadel – it’s the perfect time for our Citadel Space Star blogger to take a tour of Space Center Houston. While The Citadel team was in Houston to cover Col. Bresnik’s training for the ISS at Johnson Space Center, the folks at Space Center Houston, welcomed them into the 250,000 square-foot educational complex and space museum to have a look around. It’s the Official Visitor Center of NASA Johnson Space Center where extensive science education programs are always underway. Col. Bresnik takes time out of his last days of preparations to talk with Cadet Jared Turnage, who hopes to follow in Brenik's footsteps someday. Turnage is a rising senior and physics major who is attending The Citadel on a U.S. Airforce scholarship and recently spent three weeks in pilot training learning to fly gliders. The video signal from the Gargarin Cosmonaut Training Center in Star City, Russia, provided by NASA, is rough at the beginning of the conversation but clears up after the first minute. Col. Bresnik is a leader around the world...literally. Here's a quick look at NASA Astronaut Randy "Komrade" Bresnik's upcoming mission to the International Space Station. Be sure the keep up with Col. Randy Bresnik's work aboard the International Space Station by following him on Twitter, Facebook, and Instagram. Several days before the Change of Command Ceremony on the ISS, Col. Bresnik wears a Citadel shirt as spends the day preparing. He send the photo to us for a fun surprise. Ad he and the others were preparing, Hurricane Harvey was taking a toll on Texas, with Johnson Space Center right in the middle of the storm. The ceremony could not be shown on NASA TV on September 1 due to the storm, but it took place as scheduled, at 1:30p.m. EDT, Col. Bresnik became Commander Bresnik, as Fyodor Yurchikhin of the Russian Space Agency turned over control of the station. Yurchikhin, and NASA astronauts Peggy Whitson and Jack Fischer returned to earth safely the next day. Bresnik, aboard the International Space Station, will answer questions from Laing students on Friday during a 20-minute window between 9 a.m. and 11 a.m.
Citadel cadets and The Citadel’s STEM Center of Excellence will assist Laing students during the live conversation. Students across the Charleston County School District will also be able to watch and listen, said professor Jennifer Albert, director of The Citadel’s STEM Center. Citadel cadets will visit Laing eighth-graders to teach them about Bresnik, a 1989 Citadel graduate and a colonel in the Marine Corps. The cadets will instruct students about the space station and demonstrate how the downlink works. They’ll return on Friday to lead the conversation with Bresnik. Bresnik was selected from about 4,000 applicants in 2004 to become one of the 11 members of NASA’s Astronaut Class 9, and is the first Citadel graduate to fly in space. Expedition 52/53, Bresnik’s current mission, is his second on the Space Station; the first was in 2009. He is expected to return to Earth in December. Bresnik, whose Twitter handle is @AstroKomrade, was on board the space station during the recent full solar eclipse, and has been posting pictures on Twitter. Led by Citadel physics major, Cadet Jared Turnage, the eight grade class at Laing Middle School of Science and Technology got to learn from NASA astronaut, and Citadel alumnus, Col. Randy Bresnik as he floated in space. The current commander of the International Space Station spent 20 minutes answering questions from students and demonstrating some of the aspects of life on the station. Watch the live downlink session, courtesy of NASA, below. MESSAGE 22: WHAT'S IT LIKE TO SPEAK TO THE COMMANDER OF THE INTERNATIONAL SPACE STATION WHILE HE'S FLOATING IN ORBIT? One of the most exciting tasks performed on the ISS is a spacewalk, or extra-vehicular activity (EVA). This is when astronauts step out into space to conduct critical missions that the station’s two robotic telemanipulator units cannot. Two astronauts on Expedition 53’s crew (the current team manning the station), our very own Randy Bresnik, commander, and Joe Acaba, flight engineer, will be conducting their third and final spacewalk related to this project on Friday, Oct. 20, 2017. (Photos in the post courtesy of NASA). Their mission is to replace a fuse on a Dextre platform (one of two robotic units that conduct repairs outside the ship), set up an HD camera outside the station, prepare two units for robotic repair by removing their thermal insulation, and replace a light on the other robotic arm unit, Canadarm2’s latching system. Preparing for a spacewalk is an extremely involved process that requires days of preparation. Besides preparing for whatever that particular spacewalk’s mission tasks are (whatever components have to be repaired, replaced, removed, etc. ), astronauts need to prepare their bodies for the harsh conditions of open space. About an hour before their mission, they need to pre-breathe pure oxygen to eliminate nitrogen dissolved in their blood, which would otherwise be released as deadly bubbles when the pressure is reduced. The astronauts then hop inside the station’s airlock as it slowly decompresses from about 101 to 70.3 kilopascals (from the pressure felt on Earth at sea level to 69% of that pressure) until they can exit the station safely. Besides providing the required pressure (57.2 kilopascals – a little over half of the pressure on Earth at sea level) and oxygen, spacesuits protect astronauts from micrometeoroids and the extreme temperatures of space, which range from -250 degrees Fahrenheit in darkness to 250 degrees Fahrenheit when exposed to the sun’s rays directly. This entire process will be livestreamed starting two hours before the actual spacewalk. Check it out Friday on NASA TV starting at 6:30 a.m. EDT. Thank you, Col. Bresnik, for making our 2017 Homecoming even more memorable by sending us this message to use during the game. I wish you could have heard the crowd at the stadium - they went wild! In addition to his usual posts, on October 23, Commander Bresnik began a new photographic initiative called #OneWorldManyViews. He reached out to his followers and asked them to send him pictures of Earth from their surface vantagepoint as the ISS made a flyby over their region of the planet. For approximately 90 minutes, the orbital period of the ISS (the amount of time it takes to complete one full orbit around the Earth), Bresnik made Instagram posts prompting people from the region directly beneath the ISS to send photos as he snapped shots of that same area from the cupola of the ISS. Over the next couple of weeks, Commander Bresnik will be posting the Earth photos alongside the ISS photos and showing us just how beautiful and three dimensional our world is. See for yourself below and by following @AstroKomrad on Twitter or Facebook. (Row one - Indonesian temples. Row two - Alexandria, Egypt. Row three - Franz Josef Glacier, New Zealand). Commander Bresnik's days on this mission are numbered now, with an aniticipated return flight to earth on Dec. 14. 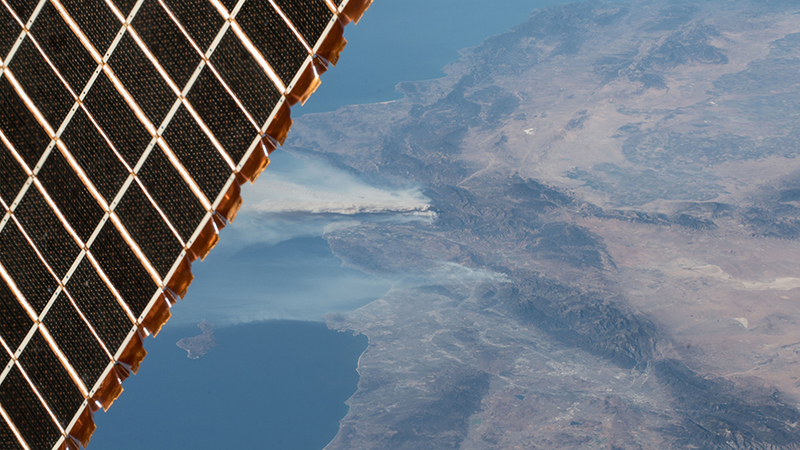 Expedition 53 Commander Randy Bresnik aboard the International Space Station took this photo of the California wildfires in the Los Angeles on Dec. 6, 2017. Two International Space Station crews are preparing to swap places at the orbital lab next week. In the midst of the crew swap activities, Commander Randy Bresnik also sent down dramatic photographs of the wildfires in California. The Expedition 52-53 trio is getting its Soyuz MS-05 spacecraft ready for a three-and-a-half hour ride back to Earth on Dec. 14 after 139 days in space. Sergey Ryazanskiy, the Soyuz Commander, will lead his crewmates Randy Bresnik of NASA and Paolo Nespoli of the European Space Agency to a parachuted landing on the steppe Kazakhstan. Next, the Expedition 54-55 trio will blast off Dec. 17 aboard the Soyuz MS-07 spacecraft and take a two-day trip to its new home in space. Anton Shkaplerov, a veteran cosmonaut from Roscosmos, will lead the flight to the station flanked by first-time astronauts Scott Tingle of NASA and Norishige Kanai of the Japan Aerospace Exploration Agency. More wildfire photos can be viewed on the NASA portal. The trio also welcomed three cargo spacecraft delivering several tons of supplies and research experiments. Orbital ATK’s Cygnus spacecraft arrived at station in November as the company's eighth commercial resupply mission. One Russian ISS Progress cargo craft docked to the station in October. And a SpaceX Dragon completed its commercial resupply mission to station in August, the company’s twelfth resupply mission. During his time on the orbital complex, Bresnik ventured outside the confines of the space station for three spacewalks. Along with NASA astronauts Mark Vande Hei and Joe Acaba, Bresnik lead a trio of spacewalks to replace one of two latching end effectors on the station’s robotic arm, Canadarm2. They also spent time lubricating the newly replaced Canadarm2 end effector and replacing cameras on the left side of the station’s truss and the right side of the station’s U.S. Destiny laboratory. Ryazanskiy conducted one spacewalk with fellow cosmonaut Fyodor Yurchikhin in August to deploy several nanosatellites, collect research samples, and perform structural maintenance.